Here is another scandal regarding Silvio Berlusconi. The Prosecutor of Trani are examining 18 phone calls - 13 in conversation with the component AGCOM Giancarlo Innocenzi and 5 with the director of Tg1 Augusto Minzolini - in which the Italian Prime Minister would ask to close political talk shows as Annozero and others. Blog: Hello, do I speak with a voter of Berlusconi? Blog: Anyways, it’s the same. Blog: What is it? Are you moving away from him? Elector: No away. I am and I remain a supporter of our president. Blog: Well, what do you think of these interceptions? Elector: You understand. These interceptions are just rubbish pulled out now that elections are coming. What timing, huh? Blog: So are you saying that they are all false? Are they a mere result of a conspiracy? Elector: I never said that. Don’t put your words in my mouth. Blog: Excuse me, have you read the interceptions? Elector: I don’t loose my time with this nonsense. Elector: And what does that mean? Berlusconi is the owner of Italian TV? Blog: It could be as you say, but do you think is it correct that the prime minister has the right to close them? Elector: Listen, do you want to know my opinion? If he did so, he has done well. Santoro is a partisan and he is there only to attack Berlusconi. Like that Marco Travaglio. Television must be of all and for all. Blog: Like Bruno Vespa shows? Elector: Do you want the truth? On Saturday the centre-left has done a demonstration and once again the only thing that unites them is Silvio Berlusconi. They should thank him because he is the only thing that holds them together! What will they do when Berlusconi will be no more here? 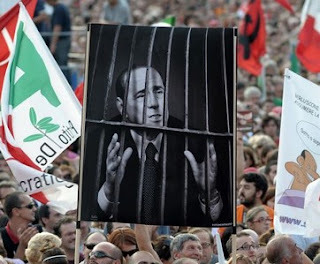 The News: Berlusconi, 18 phone calls in the acts of the Prosecution.